Our new fuel anti-surge system is the ultimate in fuel delivery for your G3 WRX or STi. In early 2008 Process West released a true plug and play anti-surge system for the MY97 to MY07 WRX/STi. We sold many 100s of these units in the last 4 years. The original system was based on a hand fabricated surge vessel with an externally mounted Bosch Motorsports 044 pump. Now in October of 2013 we have raised the bar. It was time to modernise the product and bring it up to date with the requirements of modern car fuelling and fuel types. The new system sees the pump (or pumps) mounted internally to an externally mounted anti-surge vessel made from 6061 billet aluminium. The vessel is mounted just above the transmission cross member. This is not an in-tank system. One of the main objectives when designing the system was making sure the system was easily upgradable when the need for higher fuel flows is required. The “basic” system comes installed with 1 x Walbro 460 LPH pump and is a simple plug and play option. Alternatively we offer a twin Walbro 460 system. 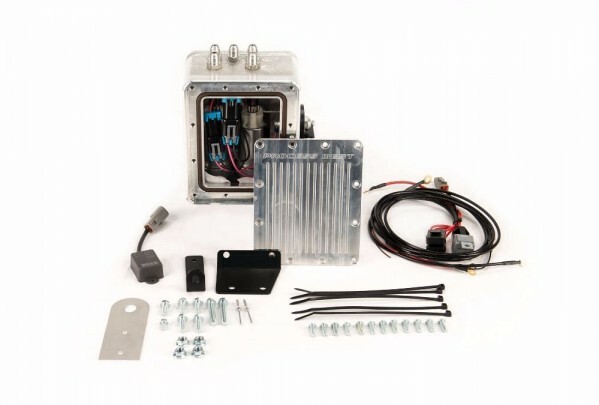 The “basic” single 460 system will satisfy the fuel delivery requirements of 90% of applications. This single pump system will support 550kw at the wheels on petrol (gas) and is a simple plug and play system. Twin Walbro 460 system will support 750kw at the wheels on petrol (gas). When purchasing a twin pump system it is worth noting that the system concludes at the pump outlets of the surge tank. From this point on you will need plumb into your existing system. When a second pump is added to the system the flow is greatly increased and the factory fuel pressure regulator is unable to control fuel pressure. At this point you will need to install an aftermarket fuel pressure regulator. For this reason all twin pump systems are configured with -6 AN fittings at the pump outlets to enable ease of plumbing into after fuel rails etc. Single pump systems come complete with all fuel lines etc to complete the installation. Both systems come with a pre-assembled wiring harness. Wiring installation is very simple and only requires soldering of 2 wires.